Die Regierung soll am Montag den 18.12. um 11h angelobt werden. Der Treffpunkt wird zwei einhalb Stunden vor der geplanten Angelobung sein – also am Montag den 18.12.2017 um 8h30 morgens. 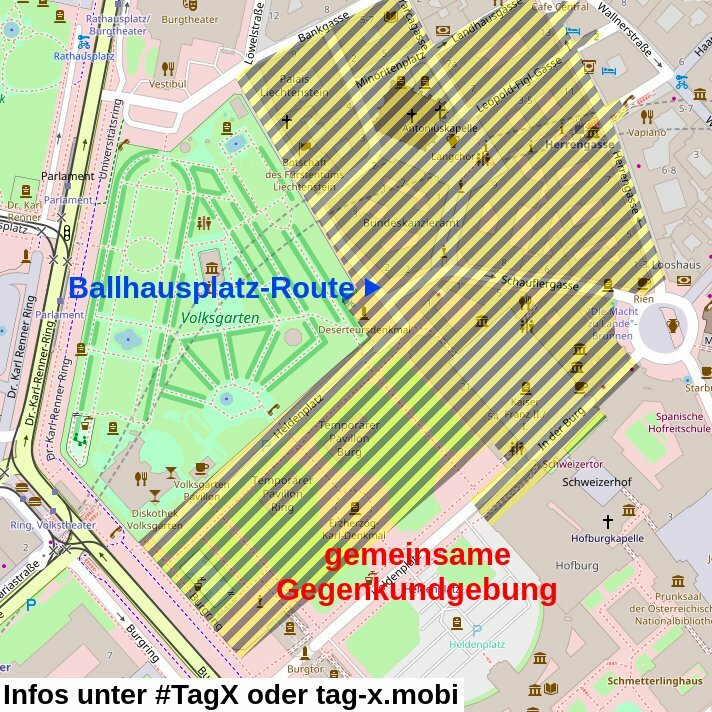 Wir werden uns am Heldenplatz (der Ballhausplatz ist Sperrzone) mit den anderen Demonstrationszügen zusammenschließen und uns gemeinsam lautstark der FPÖVP Regierung in den Weg stellen. 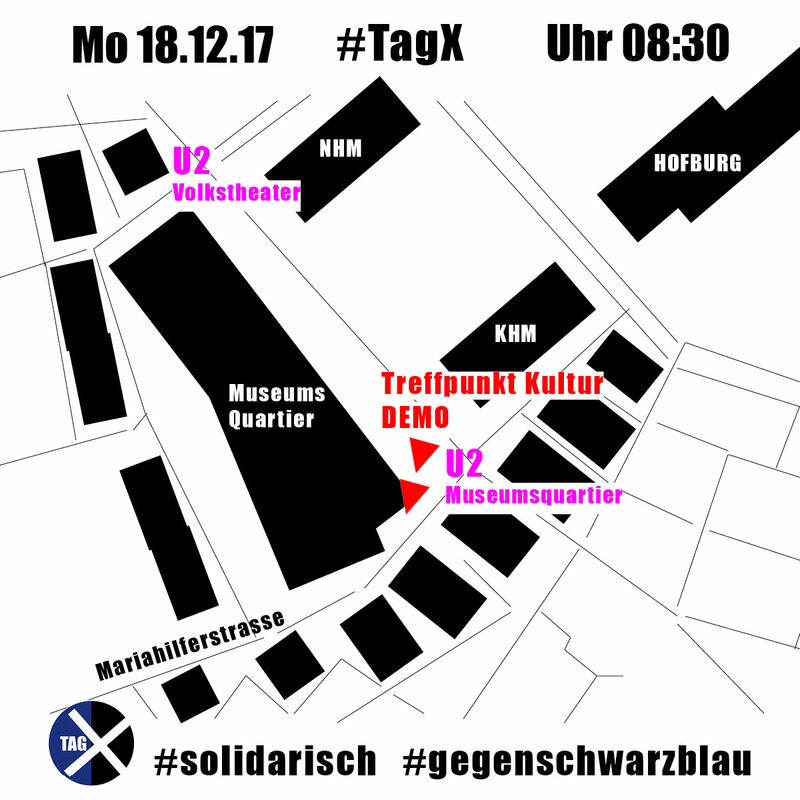 Für den ganzen Tag sind Aktionen geplant sowie eine Folgedemonstration am ersten Samstag nach der Angelobung sowie am Samstag den 13.12.2018. As independent, autonomous, and critical activists, as stakeholders in art and culture, as people active and working in cultural, educational and social fields, we speak up against any inhumanly oppressive policies. This is why we position ourselves distinctly against ÖVP and FPÖ. Only through a solidary society, in which we support each other, will we progress together. The government will be sworn in on Monday the 18.12. at 11h. The meeting will be 2 and a half hours before the planned ceremony – so at 8:30 am on monday 18.12.2017. We will join the other protest marches at Heldenplatz (the Ballhausplatz is in the security zone) and collectively demonstrate strident protest against the FPÖVP government. 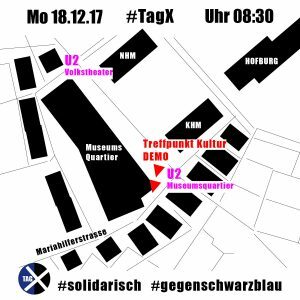 Acivities are scheduled during the whole day as well as follow up demonstrations on the first Saturday after the inauguration as well as a big demonstration on Saturday the 13.12.2018. Dieser Beitrag wurde unter die ÖH, Presseaussendungen ÖH Akbild, wir informieren abgelegt und mit #gegenschwarzblau. 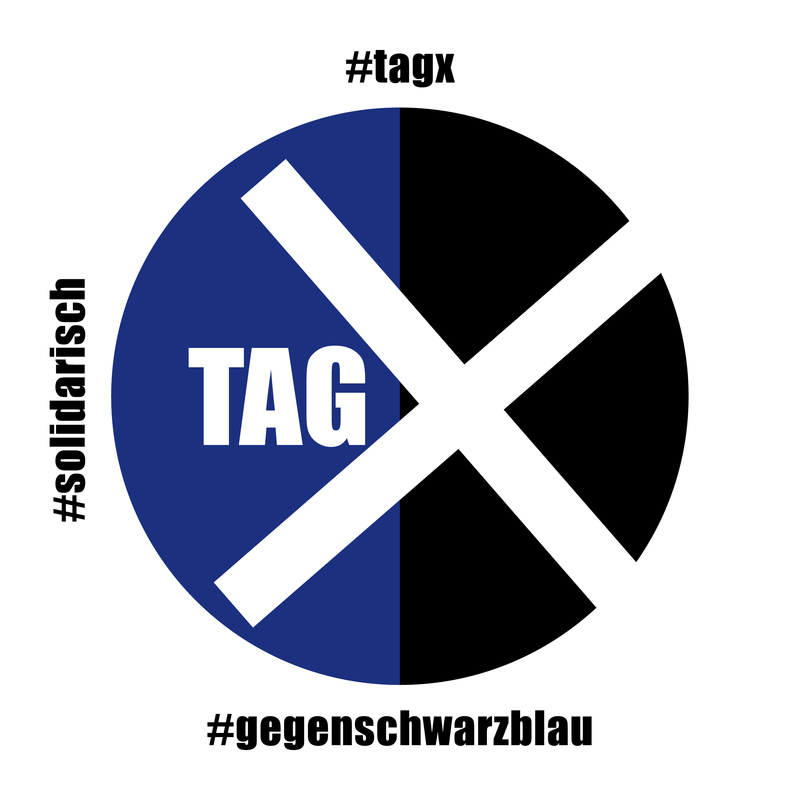 #FPÖVP, #gemeinsam, #solidarisch, #TagX #solidarisch #gemeinsam #gegenschwarzblau, 18.12.2017, Demonstartion, Protest, TagX verschlagwortet. Setze ein Lesezeichen auf den Permalink.